Dr. Smith's ECG Blog: LVH with anterior ST Elevation. When is it anterior STEMI? LVH with anterior ST Elevation. When is it anterior STEMI? This is another great case and discussion was contributed by Brooks Walsh, with some additions by Smith. Here we discuss the differentiation of true positive from false positive ST elevation in the setting of LVH. What do you think of this ECG in a patient with chest pain? There is ST elevation, but also high voltage (though the high voltage is NOT in the leads with worrisome STE, rather, it is in aVL). Is the ST elevation due to LVH? ECG #1 at 0000 hours. The ECG was repeated to get a clearer tracing and because her pain increased to 10/10 at that moment. ECG #2 at 0004 hours (this is the one at the top of the post). Only 4 minutes after ECG #1, there is greater STE in V1-V3, although it is concave-upwards. The T-waves in those leads have also significantly increased. There is ST depression in leads I, II, and aVL. The computer displayed an *** ACUTE AMI SUSPECTED*** alert. However, computers are often fooled by LVH. The criteria of Armstrong et al. would require the ST/S ratio to be 25% for diagnosis of STEMI in LVH. This is the same number used for the modified Sgarbossa criteria for LBBB. But here the ratio is only 14% - 18%, so those criteria would say that this is not LAD occlusion. The physician was concerned about STEMI, but also worried that she was overreacting, with the potential that LVH was producing a "STEMI-mimic." In spite of those worries, she activated the cath lab. There is LVH, but also a septal wall motion abnormality. No prior echocardiogram was available for comparison. The ECG was repeated when the patient reported her pain had decreased. ECG #3 at 0018 hours. The patient was nonetheless taken for emergency angiography, and a 99% mid-LAD lesion was found and stented. 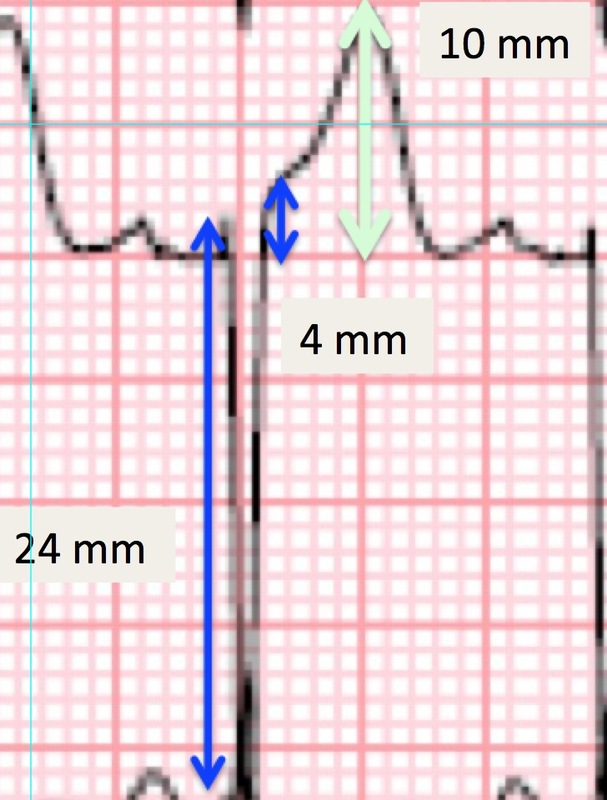 Anterior T-wave inversion, indicating reperfusion. Interestingly, few signs of LVH at this point. Can you diagnose an ACO (STEMI) when you also have LVH? Is the STE concave or convex? Case 22-1. Chest pain in known LVH, negative troponins and stress test, no wall motion abnormality. Case 22-4. Received fibrinolytics twice, but negative troponins both times. Echo showed LVH only, no wall motion abnormality. Note also that the T-waves are not tall! Is there a “Smith-modified-Sgarbossa” rule for ST elevation in LVH? Similar to the anterior STE seen with LBBB, the degree of STE in leads V1-V3 of patients with LVH is generally proportional to the depth of the proceeding S wave. In the case of LBBB, it has been shown that STE that exceeds 25% of the proceeding S-wave depth is disproportionately high, and identifies ACO with excellent specificity.9 Could this also work in LVH? One retrospective analysis by Armstrong et al. suggested that, with LVH, STE in V1-V3 that exceeds 25% of the preceding QRS complex could be an accurate means for ruling out ACO, and fairly sensitive for identifying ACO. Smith comment: The Armstrong paper did not have appropriate methods to study this. The appropriate methods would be to take consecutive ECGs with high voltage and ST elevation in the leads with ST elevation, separate them into those with and without LAD occlusion, and see what are the differences in ST/S ratio. I have inserted at the bottom of this post some examples from Armstrong's paper. You will see that they are not cases that you would have difficulty with. I have tried to study this topic twice and failed because there are very few cases of high voltage in V1-V4 and LAD occlusion. In fact, even this case does not fit, as the voltage in the affected leads does not meet LVH criteria! Most importantly, since STE in LVH rarely exceeds 4 mm in height, the 25% criterion is likely far too insensitive. For example, in a patient with an S-wave 30 mm in depth, the STE would have to exceed almost 7 mm. In our case, Lead V3 in ECG #2 shows STE/QRS = 3-4/22-24 for a maximum ratio of 17%, far short of the 25% criterion. Yet the LAD was occluded, or nearly so, at this time. 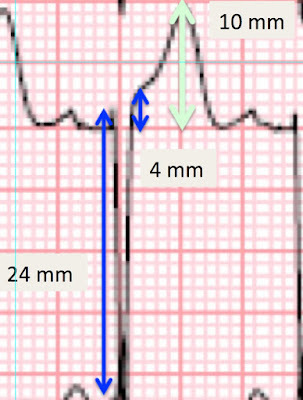 Use the T wave, not the ST segment? See all three compared. The middle one is during LAD occlusion. Is LVH like left ventricular aneurysm? The repolarization behavior of LVA is likely distinct from that of LVH. However, an analogous rule for identifying superimposed ACO of the LAD in the presence of persistent STE after prior MI (aka “left ventricular aneurysm,” or LVA) was just validated.12 An acute MI is likely if the T-wave amplitude to QRS amplitude ratio exceeds 0.36 in any of leads V1-V4 when a patient has ECG signs of LVA. It’s unclear if we can use the same analysis in patients with LVH. However, it is clear that, in lead V3 in Figure 2, the Tamp/QRSamp exceeds 0.36 by a significant margin. (It also does so in lead V2, at 7/14 = 50%). It is complete conjecture at this point, but perhaps we should be measuring T-wave heights more often in suspected ACO. Close scrutiny of T-waves have anecdotally been useful when no diagnostic ST elevation is seen, and even when a ventricular pacer has obscured the ST segment. You can see that, in neither of these cases of anterior STEMI would you be asking whether the ST elevation is due to LVH or not.A rule that is useful would help you differentiate the ST elevation due to LVH from that which is due to STEMI superimposed on LVH. 1. Huang HD, Birnbaum Y. ST elevation: differentiation between ST elevation myocardial infarction and nonischemic ST elevation. J Electrocardiol. 2011;44(5):494.e1-e494.e12. doi:10.1016/j.jelectrocard.2011.06.002. 2. 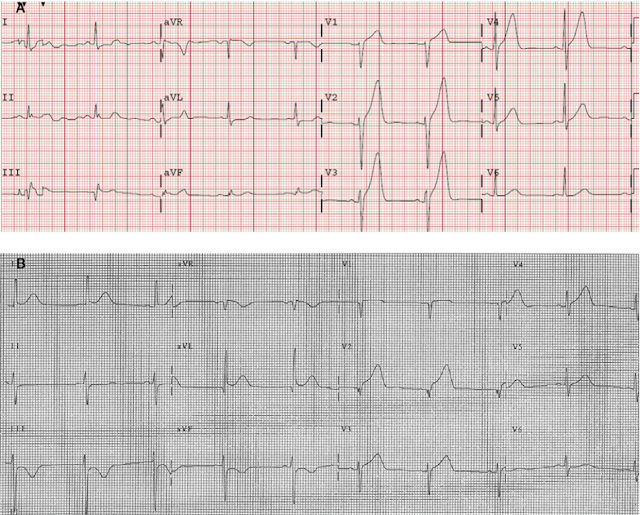 Brady WJ, Chan TC, Pollack M. Electrocardiographic manifestations: patterns that confound the EKG diagnosis of acute myocardial infarction—left bundle branch block, ventricular paced rhythm, and left ventricular hypertrophy1. J Emerg Med. 2000;18(1):71-78. doi:10.1016/S0736-4679(99)00178-X. 3. Birnbaum Y, Alam M. LVH and the diagnosis of STEMI - how should we apply the current guidelines? J Electrocardiol. 2014;47(5):655-660. doi:10.1016/j.jelectrocard.2014.06.001. 4. Brady WJ. Electrocardiographic left ventricular hypertrophy in chest pain patients: Differentiation from acute coronary ischemic events. Am J Emerg Med. 1998;16(7):692-696. doi:10.1016/S0735-6757(98)90179-6. 5. Armstrong EJ, Kulkarni AR, Bhave PD, et al. Electrocardiographic Criteria for ST-Elevation Myocardial Infarction in Patients With Left Ventricular Hypertrophy. Am J Cardiol. 2012;110(7):977-983. doi:10.1016/j.amjcard.2012.05.032. 6. Shamim S, McCrary J, Wayne L, Gratton M, Bogart DB. Electrocardiograhic findings resulting in inappropriate cardiac catheterization laboratory activation for ST-segment elevation myocardial infarction. Cardiovasc Diagn Ther. 2014;4(3):215-223. doi:10.3978/j.issn.2223-3652.2014.05.01. 7. Schocken DD. 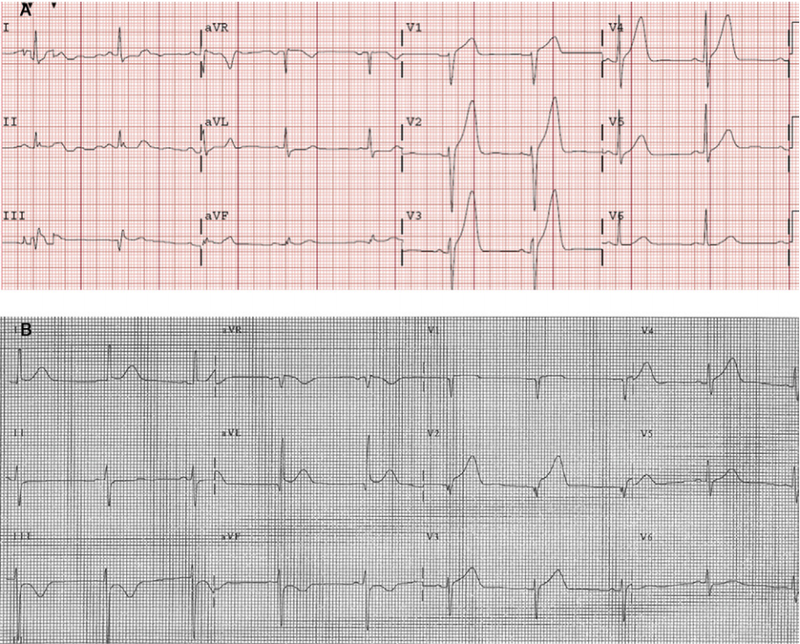 Electrocardiographic left ventricular strain pattern: Everything old is new again. J Electrocardiol. 2014;47(5):595-598. doi:10.1016/j.jelectrocard.2014.06.005. 8. Smith SW. Upwardly concave ST segment morphology is common in acute left anterior descending coronary occlusion. J Emerg Med. 2006;31(1):69-77. doi:10.1016/j.jemermed.2005.09.008. 9. Meyers HP, Limkakeng Jr. AT, Jaffa EJ, et al. Validation of the modified Sgarbossa criteria for acute coronary occlusion in the setting of left bundle branch block: A retrospective case-control study. Am Heart J. 2015;170(6):1255-1264. doi:10.1016/j.ahj.2015.09.005. 10. Collins MS, Carter JE, Dougherty JM, Majercik SM, Hodsden JE, Logue EE. Hyperacute T-wave criteria using computer ECG analysis. Ann Emerg Med. 1990;19(2):114-120. doi:10.1016/S0196-0644(05)81792-5. 11. Sovari AA, Assadi R, Lakshminarayanan B, Kocheril AG. Hyperacute T wave, the early sign of myocardial infarction. Am J Emerg Med. 2007;25(7):859.e1-e859.e7. doi:10.1016/j.ajem.2007.02.005. 12. Klein LR, Shroff GR, Beeman W, Smith SW. Electrocardiographic criteria to differentiate acute anterior ST-elevation myocardial infarction from left ventricular aneurysm. Am J Emerg Med. 2015;33(6):786-790. doi:10.1016/j.ajem.2015.03.044. 13. Neuman Y, Cercek B, Aragon J, et al. Comparison of frequency of left ventricular wall motion abnormalities in patients with a first acute myocardial infarction with versus without left ventricular hypertrophy. Am J Cardiol. 2004;94(6):763-766. doi:10.1016/j.amjcard.2004.05.061. Again, pretty interesting case and discussion around it! Would you please comment on the poor R wave progression from V1 to V4 and almost absent in some ECG as increasing the anterior MI index of suspicion in those ECGs, especially in V4 where it's minimal and in the context of LVH. You also mentioned AVL 11 mm as a strong LVH marker, but how would you compare it to Cornell criteria (S in V3 + R in AVL), which is quite positive here here (around 33 on the first ECG, normal for woman 20). Many thanks for your work and happy 2016! --LVH also has very poor R-wave progression in V1-V4, as the LV mass is rotated around to the left. --I really don't use LVH critieria because they are not useful in interpreting presence or absence of superimposed ischemic ST elevation. They were not developed for that purpose, rather only to diagnose the presence or abscence of LVH. In fact, they are not very sensitive or specific for that purpose. --However, presence of LVH with repolarization abnormalities is very specific for LVH, and also these are the cases that are problematic for the reperfusion decision. --For that, one must simply assess the proportions on the ECG, and that is subjective because there are no hard criteria to go by. My sense is that there may not be any set “criteria” to distinguish between LVH vs anterior ischemic ST elevation for ECGs like that in ECG #1, such that cases need to be assessed more on an individual basis (as was done in this case). Bedside echo with serial ECG comparison can be invaluable in such cases, as you have shown. Great case and nice discussion, thanks for all. I just wanted to add that I believe ST depression in inferior leads in this case, with negative QRS complexes, are not compatible with ST changes due to pure LVH. No problem, of course. Sorry for delay. Just give credit. Wonderful case study and discussion, thank you! Yes, Brooks did a great job! Thanks!